WASHINGTON—Hastily scrawling with crayons and markers, Donald Trump Jr. and Eric Trump were reportedly forging their father’s signature Wednesday on letters they had written excusing them from any further testifying as part of Special Counsel Robert Mueller’s investigation into their family’s role in potential Russian election interference. 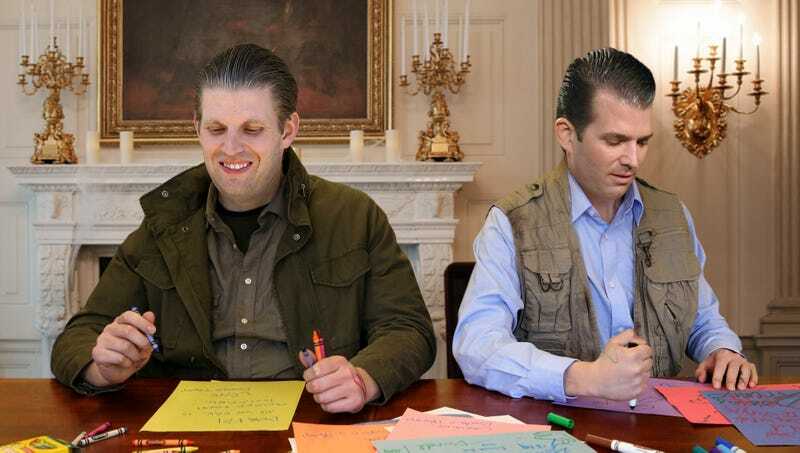 “To ALL it may conzern, my two beutiful Sons are herebye Excused from anymore testifonials to mean mister Muler,” the two wrote on dozens of pieces of construction paper before Donald Jr. falsified his father’s signature, following a heated hour-long argument over who did a better imitation of the president’s handwriting. “My son’s Eric Jr and Dom haev a realy bad sick thing in their throats Forever now so they cant talk to mr. Muller ever again and he should leave Them alone okay? Sincerly the Presdient of United states.” At press time, the Trump boys were enclosing the letters in envelopes addressed to a variety of government agencies, police departments, and fire stations around the country as well as affixing stickers of gold stars or American flags to ensure each envelope looked official.